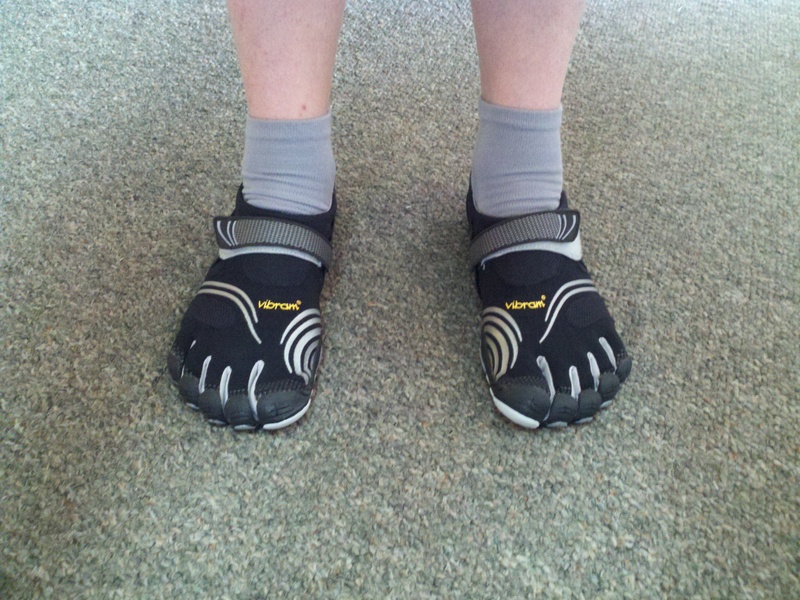 I bought some goofy shoes today… the kind with all the toes broken out into individual little pockets. I saw them a couple days ago in a local sporting goods store and thought they might just help with that cramped feeling my toes have. I know you might just be thinking “get bigger shoes idiot”, but my issue with shoes goes way back. I have wide feed, and I have long secondary toes. The two together mean if I buy shoes big enough for my wide feet and my long toes, my feet swim around in them and either I get blisters or my foot slides forward and my toes get smashed into the fronts of my shoes every time I plant my foot… or both. 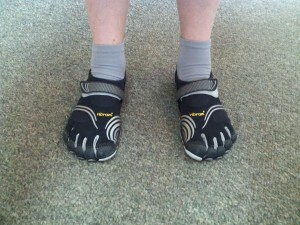 Over the years, my toes have curled up into classic hammertoe position, crushed by the western version of foot-binding. Today, I found myself near the same sporting goods store and I figured I’d give ’em a whirl. There were several kinds there, most designed like odd sandals or strange flip-flops with straps. I chose the KomodoSport because doesn’t expose the top of the foot and looks more like a regular shoe. The one thing I would NOT do is wear them without socks. I hate the feeling of a squishy, almost slimy feeling piece of rubber or sweaty foam rubber against my feet. That’s one of the reasons I can’t get into flip flops… too much skin on plastic and rubber. Sitting on the fitting bench in the shoe department, I put the special toe-socks on and stuck my feet into a pair of these things. At first it was a struggle to get my toes to uncurl and actually be flat enough to go into each individual toe hole. It felt a little like trying to put on a glove while making a fist. After about 30 seconds of wriggling things around, my feet finally slid into place… and it really did feel like I was wearing gloves on my feet. After I got them on, I sat there wiggling my toes a bit. While it felt like my socks had ridden up between my toes, if I sat still for a few seconds it hardly felt any different from wearing regular shoes. The major difference was walking around in them. I stood up and strolled across the room, then jogged back. There was a fake rock in the middle of the shoe department, there for people to test out various hiking shoes and boots on. I climbed up it a few steps and was impressed with the grip these shoes still had with so little rubber on the underside. With each toe being separately articulated, I could feel the contours of the rock underfoot and flex each toe to better grip it. But my main goal isn’t to hike in these shoes, it’s to retrain my toes that they should look more like tiny fingers on my feet rather than curled up shrimp. After about two hours of wearing and walking around in them, my toes actually did start to relax… much the same way they do when you first take regular shoes off. As I type this, my feet sit and wait patiently for me under my desk, as they do every day, and I don’t feel the need to kick my shoes off and type à la sock-foot. In fact, I would describe the feeling as: wearing armored socks. The shoes are light weight and breath very well… I feel like a modern ninja master might use these to sneak around in, rather than the old school split-toe design. I’m sure as the day goes on, there will be things I like about these shoes and things I don’t. Already I know I can’t wear them for doing yard work or anything like that… the tops are made of thin mesh material and my foot would get cut right up with the mesh if I dropped a shovel or something similar. For now though, I’m happy with them as private office shoes. This entry was posted on Wednesday, July 20th, 2011 at 5:08 pm	and is filed under Reviews. You can follow any responses to this entry through the RSS 2.0 feed. You can leave a response, or trackback from your own site.